very nice hostel. social and chilled vibe. not a party hostel but definitely not boring. nice stuff as well, especially jag, antonio and lucas were really nice to hang out with! We had a fantastic time at Puriwasi Hostel. The beds were comfy, the rooftop perfect and the staff really nice. Especially Luca at the bar and Fernando at the reception... Thanks! ---: The staff works crazy hours, and one of the nicest staff we had , was fired by the manager for "BEING TOO GAY" , UNBELIEVABLE +++:The staff is amazing and will do everything to make you feel at home and help you. Especially Edith, Michel, and Samantha. The dorms are nice and clean. There are hot showers and good. 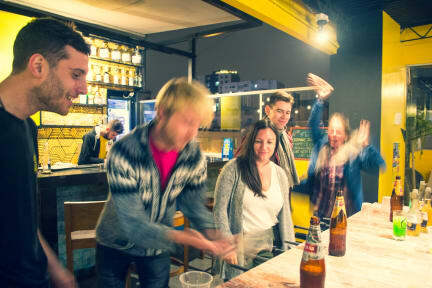 The hostel is very safe and well located and they have their own rooftop bar and a kitchen for guests to use. Also great for meeting amazing people. Gut gelegen in Miraflores. Zimmer mit grossem Schliessfach, im Hochbett wurde es jedoch eng zwischen Bett und Decke. Genügend Sanitäranlagen. Die Dachterasse ist super schön zum Frühstücken, entspannen und um am Abend einen Pisco zutrinken. Super friendly staff, that organizes events for the guests every evening. So, it´s very easy to meet other travellers. 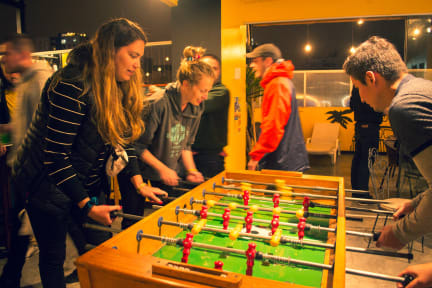 The bar closes at 12, so you can still get a good night of sleep or go out to a club with the hostel. The 8 bed dorm is actually a lot bigger than it looks on the pictures. The matresses are big and comfortable and the lockers are so huge, that you can fit all your stuff in there. One downside, the kitchen is barely worth mentioning, it´s just a fridge and a microwave. Hostel in a good location with nice and helpful staff. Had to wait quite long for check in even though it was after 1pm. We stayed for 5 nights in Puriwasi hostel and it was very nice! The Staff was very kind, helpful and always smiling :) Special thanks to Fernando! The WiFi in our room was not to good but that’s the only negative thing to say. On the rooftop there is a small bar where You can get drinks for fair prices wich is another plus.